During your tour, our friendly guides greet you at the top of the first zipline, providing all of the knowledge and gear necessary for zipping with confidence. After our guides secure you in your harness, they will assist you in soaring across our six ziplines. The safety of our patrons is the number one priority for our guides—just follow their lead and enjoy the ride! 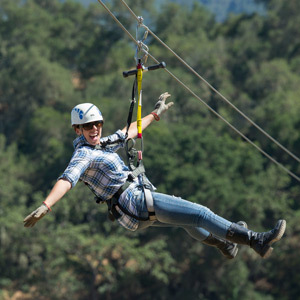 -We have invested in state-of-the-art zipline equipment and technologies. Our ziplines meet or exceed all design and safety requirements set forth by governing agencies. -We are certified by the State of California’s Permanent Amusement Ride (PAR) inspection program. The PAR program requires us to meet all state safety standards and to pass three annual inspections. -As part of our safety program, we also conduct a daily inspection of all gear in use and a weekly inspection of all equipment, and we also conduct monthly maintenance and service on all six of our ziplines. Click here for our tour pricing page. Discounts are available for groups of eight or more; call us at (805) 457-3966 to inquire. You may bring a camera or other devices at your own risk. GoPro cameras are available to rent. Tour size varies, with a maximum of 21 guests. No open-toed footwear is allowed. Please wear comfortable clothing with closed-toed shoes suitable for light hiking. Please avoid loose clothing and dangling jewelry. Consider wearing layers, as temperatures can change during your tour. Do I need prior experience with to take a zipline or kayak tour? No prior ziplining or kayaking experience is required, our friendly guides show you the way. Can children take the zipline tour? Yes, as long as they are at least four years of age. Children weighing between 30 and 90 pounds must zipline tandem on longer lines. Are there any physical or health restrictions? Tour guests must weigh between 30 and 275 pounds, and be at least three years of age. The zipline tour includes two uphill hikes of moderate intensity; you must be able to complete these hikes unassisted. People who are physically impaired are still able to participate on our zipline course. See below for additional health restrictions. Yes, we place an uncompromising priority on safety. See below for more information on our safety commitment. Yes, advance reservations are required. Please arrive 20 minutes prior to your tour time. See below for cancellation policies. Total time for zipline tour is 2 to 2.5 hours, and includes six ziplines. Total time for kayak tour is approximately 4 hours. 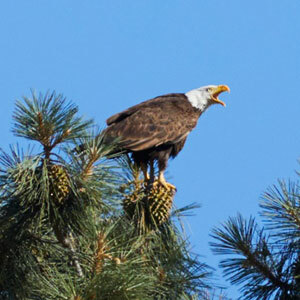 Total time for wildlife tour is approximately 3 hours. May I bring food or drinks? We provide water throughout the zipline tour. Keep an eye out for orange jugs with cone cups at the beginning and end of each zipline. We also provide an ice chest full of water, soda and juice at the end of your zipline tour. You are welcome to bring a snack and leave it on our tour vehicle for your enjoyment at the end of the tour. We encourage you to bring a baseball hat and sunglasses. We have straps for glasses available for sale. You should bring any medical supplies you may need, such as epi pens and diabetes supplies. You can bring your own camera, Go-Pro, or mobile phones but they are “use at your own risk.” We will provide you with a fanny pack to bring your miscellaneous items with you while ziplining. When should I arrive—and what if I am late? Please arrive at least 15 minutes prior to your tour start time to check in and get oriented. Our tours leave right on time and if you are late you will literally miss the bus. We will do our best to reschedule you if you are running late due to unforeseen circumstances. Season passes are currently not available. However, if you return for a second zipline tour, you can join our Frequent Flyer Club. After your second zipline tour and every tour thereafter, you will be given a voucher for $20 off your next zipline tour. Ask about joining when you are in our office, or call us at (805) 457-3966. Yes, gift certificates are available for sale through our website. The purchaser selects the ticket(s) that they would like to give and pays for them online and immediately receives a printable gift voucher. The recipient of the gift may use the voucher code to reserve their tour online. To purchase, click here to go to our home page and hit the large “BUY YOUR GIFT CARD” button. Can birthday, bachelor and bachelorette parties join a tour? We love celebrating your big moments with you. Our zipline guides can even provide your special someone with a celebratory decorative helmet to make them feel special. Discounts are available for groups of eight or more; call us at (805) 457-3966 to inquire. After your tour, you are welcome to use our patio next to our office to celebrate with a picnic or head to the local Santa Margarita Park. If you would like to have lunch or wine tasting at our affiliated Ancient Peaks Winery, groups of seven or more should call ahead to schedule a reservation. Call Ancient Peaks Winery @ (805) 365-7045. If it is raining or the weather is otherwise too inclement during your designated departure time, you will be issued a full refund. However, do not assume that stormy weather prior to your tour means automatic cancellation with a full refund. We make the final decision on whether or not to suspend a tour. If we decide to cancel your tour in advance due to inclement weather, we will call you at the number you provided while making your reservation. You may contact us for updates: (805) 438-3120 and contactus@margarita-adventures.com. We operate in most Central Coast conditions from warm days to light rain. We encourage you to look at the weather prior to your tour and come prepared. Can my children zipline by themselves? Children 13 years of age or older can zipline by themselves. All children under the age of 13 must be accompanied by an adult or an older teenager at the discretion of the parent. Dogs are not allowed at Margarita Adventures and we cannot watch your dog. Please do not leave your dog in the car as it is extremely warm here many months of the year. Thousand Hills Pet Resort is a great doggie daycare where you can drop off and pick up your pet between 7:30 a.m. to 6 p.m. on Monday through Friday, and 8 a.m. to 5 p.m. on Saturday and Sunday. All pets are required to have a health form filled and current immunizations. You must review and sign our Guest Agreement Form before embarking on our tour. We will provide you with the form through your confirmation email. We require advance reservations. Space is limited, so we encourage you to make reservations as early as possible. We charge full payment when the reservation is made, but it is fully refundable up to 48 hours prior to your tour date. See our cancellation policy below for details. You have until 48 hours before your appointed tour date to cancel for a full refund. Inside of 48 hours we do not offer any refund. To cancel your reservation, please call us at (805) 438-3120. Monday through Friday – 9 a.m., 11:30 a.m., 2 p.m.
Friday Evenings – 4:30 p.m., 7:30 p.m.
Saturday and Sunday – 9 a.m., 10:30 a.m., Noon, 1:30 p.m., 3 p.m.
Thursday through Sunday – 9 a.m.
Monday through Friday – 4:30 p.m.